With the famous motto of Run, Bike, Swim! 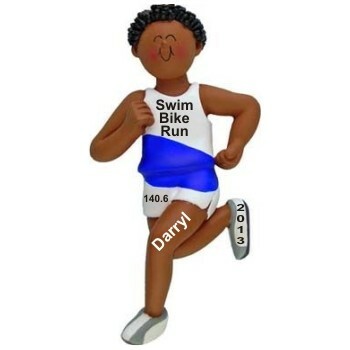 this Triathlon runner ornament for an African American male makes a great memento of her stellar effort. Personalized the Triathlon ornament with the motto of your choice, the runner's name and number, and/or the year. Our African American Male Triathlon Runner ornament measures 4"H, and arrives nestled in our black velvet drawstring bag. For my BF Nov 13, 2014 Tamika Y.